any idea as to whats wrong? Those would be my first assumptions as far as a problem. The watering problems jump to mind first. If there is a fungal infection there should be mycelia in the soil and/or on the plant. as far as the watering ill try keeping that in mind and see if that changes anyting, although i find that odd cos ive taken similar care of both plants. It looks to me that your plant is lacking nutrients. I don't see evidence of a fungal infection (that doesn't mean that there isn't one though). Try fertilize with liquid seaweed fertilizer once a week and see if the problem clears up. Last edited by opabinia51 on Sat May 27, 2006 12:06 am, edited 1 time in total. thanks, ill try dong that! 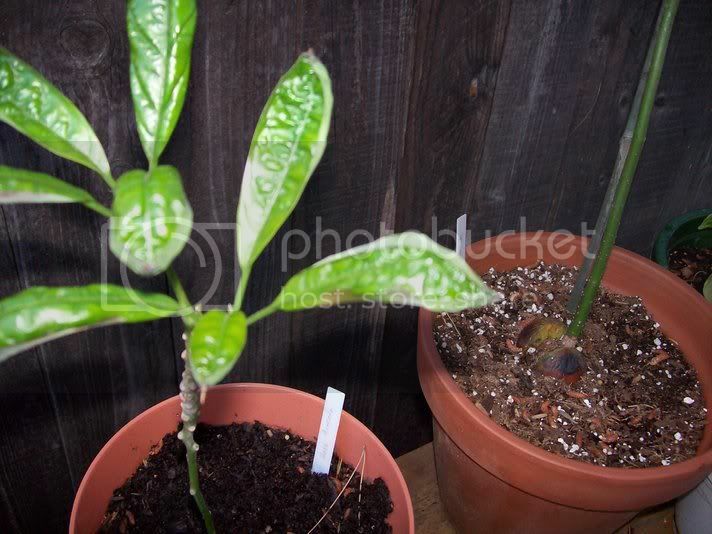 When you plant avocado seeds place them point up just under the dirt so they still get some light but do not get sunburn. We plant over 300 seeds a year at the research station in Irvine. Some plants look great some plants never take off. It's easiest to call it a bad seed. Remember Hass or Reed is only half of the parentage. LOL I have the opposite problem ,mine are growing like mad. Only really confusing bit about the larger of my pair is why its now putting out leaves where old ones had been shed, we are talking all the way down to the base of the trunk from where the very first set of true leaves dropped. Its just over 2 years old and other than this strange developement seems a happy healthy plant. As I have never had one last this long in soil(its in a huge pot in my front yard) Im not sure if this is normal or not. I did plant 3 more seeds and all 3 sprouted and one got to about 3 inches tall, then the worst happened: baby possum!! Darn think knocked down a bunch of my pots and the avocado seedling snapped... yargh! These are the trials and tribulations associated with gardening... makes it that much more exciting when we have success! There was a lady who did the same thing that you are doing Angry. You know, you might try growing the plants in wider pots so that they are less likely to be knocked over. 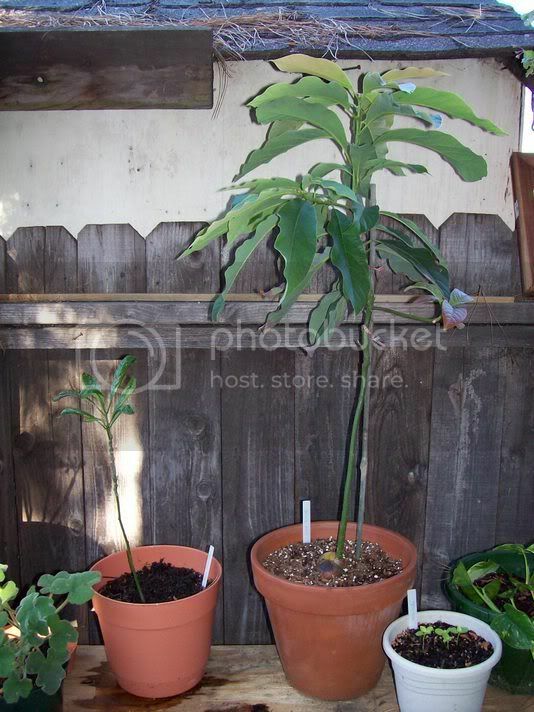 The trees seem to be getting quite tall and I'm pretty sure that by the height that you posted, that the root balls would be taking up the entire pots (that you currently use) anyway. I have been told by our local organic gardening expert that you should start out with small pots and move up as the plants get larger. If you start out with a large pot and a single seed, there is an increased chance of fungal infection. That being said: I usually just start out with a large pot, except with tomatoes and flowers. Excellant! I like your technique. Perhaps spreading some ground black (or white) pepper around the area to detur the little guy from coming around. Though don't use cayenne pepper because this can wreak havoc on the mucus membranes of mammals. Any Benefits of Growing from Seed?